M Missoni is a collection which provides women with a total look. It is easily recognisable on an international level thanks to its distinct style and uniqueness. 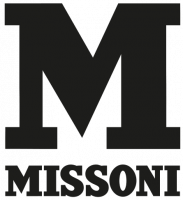 The group produces the M Missoni line under a licensing agreement it has 973 shops in 71 countries. First Direct Operated Store was opened in 2006 in New York, then Macau (in 2007) and 4 more DOS in USA in the first months of 2008 were opened. Exclusive freestanding shops opened in the last 2 years in Dubai, Kuwait City, Shanghai, Beijing and Kaohsiung. In April 2008 opened the last Exclusive Boutique in Bucharest. In 2007 brand revenues stood at 47 million euros, a 48% upturn in sales compared to the last financial year. M Missoni has one boutique in the U.S. in the SoHo district of New York. The hope to open stores in Los Angeles, Boston, Chicago, Miami, Dallas, and Atlanta (Near 10% of profits which will be given to Missoni S.p.a). The collection targets women with an evident sense of class in her leisure pursuits as well as her professional endeavours. The collection is an imaginative interpretation of the traditional Missoni style; rich in colour and elegance, with refined patterns and materials.